I think this is an interesting discussion. I really don't know much about European horse passports, but weren't they intended to keep horses treated with certain medications out of the food supply? And once a horse is declared "not for human consumption," which is irreversible, there is no more need to record every vaccination/medication that a horse receives? I never thought of the passports as medical records per se, recording major health issues as well as medications, but I very well could be wrong. I guess I need to do some research, when I have some time. I would love to hear from some of our racing connections that breed and race in Europe as well as the USA as to what is required of them. It would be a good topic for one of the round tables to discuss. Although this may not even be put on an agenda as a topic for discussion because it's a pipe dream without a national governing body. I think that, even if all the passport did was keep more horses out of the slaughter house, I'd be in favor. The current prohibitions against slaughtering racehorses for human consumption don't see to be working. I'm intrigued by the idea of having more disclosure of major medical issues though, and how that could be accomplished. Image is from Taylor Made Farm Twitter feed. Moms Command wrote: I realized this has been thoroughly hashed out, but, I thought I would throw in my two cents. I breed commercially, and I pay little or no attention to true nicks. For me, conformation is key, because, that's what the buyers are looking for. I don't have the money to buy it all, so I get as much pedigree as possible, without losing conformation. Ive been breeding for 10-12 years now, and this year my 3 yearlings and 1 weanling averaged $103,000, with moderate to low stud fees. The mare you talked about with the C+ true nicks would definitely be the most appealing to me for several reasons. She has the best conformation, she's pregnant to a first year horse (always the safest when breeding commercially on a budget) and she has a Tiznow in the pipeline. Those are all huge pluses when breeding to sell. Breeding to race is a whole different beast. I wish it was not, but, that's the way it is if you have limited funds. When the market gets off a horse, they're off, even if it's a consistent race horse sire, like Afleet Alex, or Midshipman. Thanks for the different perspectives! Sort of brings home how different it can be to breed for sales vs. breed to race. Sparrow Castle wrote: I think this is an interesting discussion. I really don't know much about European horse passports, but weren't they intended to keep horses treated with certain medications out of the food supply? And once a horse is declared "not for human consumption," which is irreversible, there is no more need to record every vaccination/medication that a horse receives? I never thought of the passports as medical records per se, recording major health issues as well as medications, but I very well could be wrong. I guess I need to do some research, when I have some time. I would love to hear from some of our racing connections that breed and race in Europe as well as the USA as to what is required of them. It would be a good topic for one of the round tables to discuss. Although this may not even be put on an agenda as a topic for discussion because it's a pipe dream without a national governing body. I think that, even if all the passport did was keep more horses out of the slaughter house, I'd be in favor. The current prohibitions against slaughtering racehorses for human consumption don't see to be working. I'm intrigued by the idea of having more disclosure of major medical issues though, and how that could be accomplished. In my mind, it's an excellent idea hampered by the same problems as having a uniform drug policy. It all still needs to be unified together as one else we'll have much of the same problems we have now. But assuming I can wave a magic wand: my ideal would be "horse passports" detailing breeder info, change of ownership, tattoo/microchip/other identifying info, and major health issues/procedures. From personal experience, buying a horse (for pleasure riding!) is full of minefields of unknown and/or lost info. It would greatly simplify things and probably help re-home/track horses as they drop through the claimers/slaughter, administered by some sort of national governing body which could simultaneously oversee violations and drug policy. /sigh We can dream, right? Fortunately for you all, Taylor Made has anticipated your passionate argu-*cough* I mean discussion. Here is a link to a conformation video they have kindly provided. It includes walk-up, side shots, and a few walking side shots. And yes, he does toe out a bit. That being said, he's also not Daffy Duck. Why on earth aren't we discussing the merits of any other horse's conformation to this extent? If I recall correctly, wasn't Arrogate's conformation recently criticized as being unattractive? What's the reasoning for that? While he doesn't seem to have the greatest shoulder, he doesn't seem much worst than any other stallion. Thank you Honor Code. I also posted a link to that confo video as a way to let people see the truth for themselves. Didn't help as later he was called "Daffy Duck." Hence my "ladies and gentlemen" retort. Ridan_Remembered wrote: Thank you Honor Code. I also posted a link to that confo video as a way to let people see the truth for themselves. Didn't help as later he was called "Daffy Duck." Hence my "ladies and gentlemen" retort. 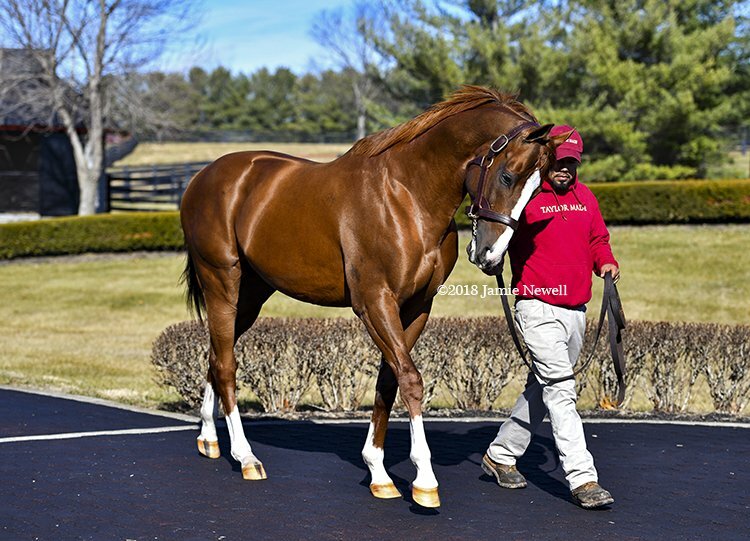 Nobody disputes that California Chrome is a handsome, extremely talented racehorse. I'm not sure why you are so defensive about his front end. It is what it is--and claiming it isn't won't change that. If you're interested (and I fully realize that you are probably not) when you watch the part of the video where CC is coming toward the camera, the important thing is not to look at his front feet, but rather to watch what his knees are doing relative to his front feet.